- Finish: Natural / Nitric / Nickel / Tin / Silver plating etc. - Size: As per customers requirement. Price: Approx 5 rs to 500 rs per piece as per quality and market. Owing to our in-depth industry experience and precise knowledge of this domain, we are offering an outstanding assortment of Fastener Screw. Approx 150 Rs to 200 Rs per 100 piece as per quality. 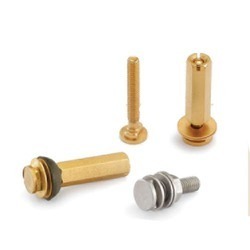 We are leading manufacturer, supplier and exporter of MS Knurling screws and all types of customized Fasteners. Note-We manufacture as per customer requirement and products specification. We offer our customers the best quality transformer parts, which is precision engineered at our manufacturing unit. Checked for it's strength, our range is offered at competitive rates to our clients spread across the globe. 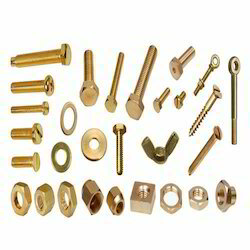 We are Manufacturing Different types of Brass Fasteners like Brass Anchors, Brass Construction Fasteners, Brass Auto Fasteners, Brass Nuts, Bolts, Screws amp; Washers, Brass Rivets, Spacers amp; Studs, Brass Chicago Screws, Brass Ceiling Screws, Brass Slotted Pan Head Screws, Brass U Bolts, Brass Carriage Bolts, Brass Hex Nuts, Brass Dome Nuts, Brass Wing Nuts, Brass Precision Fasteners. Sizes: ½ ", ¾ ", 1", 1 ¼ ", 1 ½ ", 2"